CustomWritings.com website is heard by many students. So I decided to try them and write my own Custom Writings review. When you visit it, you can calculate the price of your order, choose your format and features and receive a free plagiarism checker. They also claim professional writers, plagiarism free papers, and an 8.5 out of 10 average quality score. 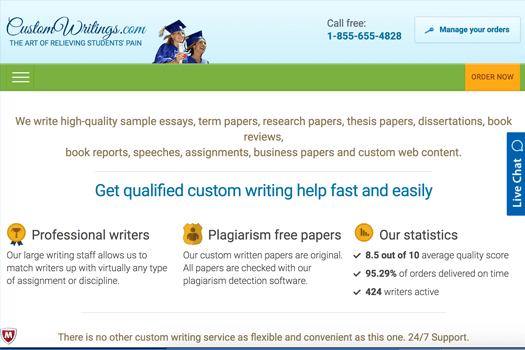 CustomWritings.com owned by ONE Freelance Limited company which launched Bid4Papers, EssayShark and a lot of other minor essay websites. The website is not identical this time, they at least changed some things around. It's still similar, but you wouldn't be able to tell the similarities at first, so I guess they made it better for this one. Now, despite the fact that CustomWritings.com is owned by the same company as the two sites I've mentioned (click here to read the story), they are slightly different. This time they use the traditional system which means you get assigned a writer and you have no control over who it is. I beilieve customers' orders are performed by another team of writers. 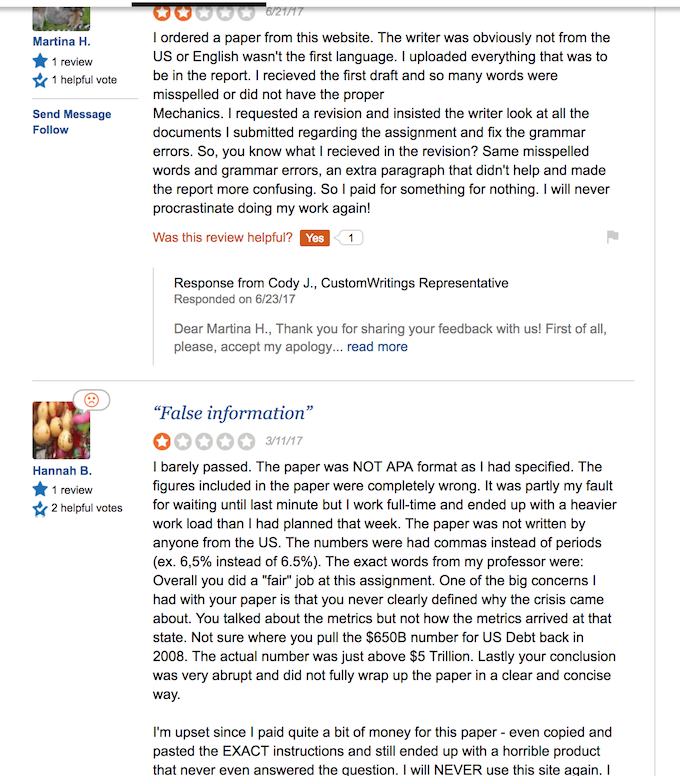 I forgot about EssayShark (check review) and Bid4Papers (one more review) for a while and while browsing for other essay writing services I found out CustomWritings. At the time, I didn't know that they were owned by the same people as well, since I've forgotten about the other two. Long story short, the experience was really surprising. I got a timely delivery and not bad quality of the paper. The communication with the writer was almost absent. I chose an option of an Advanced writer but they have only done so in words. In my opinion, an overpayment of +25% wasn't worth it. Nothing too terrible, but I think this is the reason why I will no longer use this service. You can definitely find better options that offer the quality every paper needs. Prices are decent, similar if not exactly the same as Bid4Papers and EssayShark. 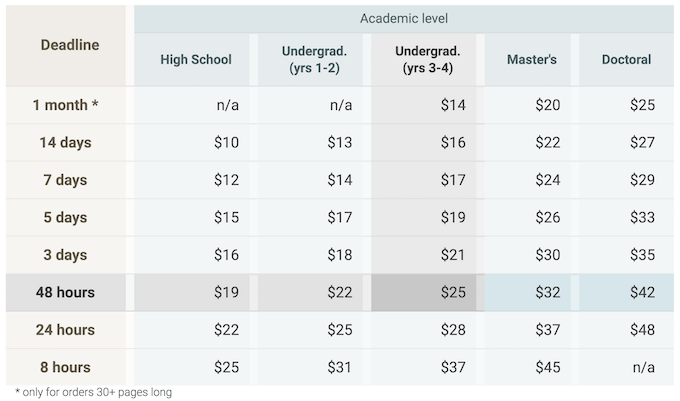 It's not that expensive compared to other essay writing services. They also promise great discounts but no promo codes were found. CustomWritings' flexible discount policy can be rewarding, but only if I become a regular customer and frequently order from them. For their so-called Lifetime Discount, I can save as much as 15% from my purchases. They will then send you an email once you're eligible for an exclusive lifetime discount code. Quality is clearly not their forte, as the first draft presented formatting mistakes that were corrected after free revision. The sentences made sense but the overall writing quality wasn't sufficient for my needs. From the order form, I was given the option to choose a Writer Category: Best Available, Advanced, or ENL. With the latter, it's safe to assume that not all of their writers are native English speakers, and you have to pay extra for them. I also need to pay extra for add-ons like progressive delivery and getting a copy of sources, though I can get these features for free in other agencies. For these, you'll want to consider looking for an alternative that offers these options free of charge. All popular payment methods are available. With these, there are no problems at all. They've put their money-back policy up straight, and it's quite comforting that they point out your "right" to it rather than presenting it as an "option". The refunds are, as stated by the brand, "overseen by a team of specialists" - each case will be processed and reviewed within the period of two weeks. As for the CustomWritings.com revision policy, everything appears to be as plain as can be. There are only three things you'll have to keep a watchful eye on, including the identical set of instructions (you've previously given to the writer), all revisions are submitted with the designated "revision button", and you have a week after the initial approval of the order to submit your revision request. All things considered, both policies appear fair, and tend to favor the customers rather than protecting the company itself by providing an adequate set of setups, baits, and legal "shields". CustomWritings earned their fame among students and college freshmen, who appear to be their most frequent users. Even though the testimonials and reviews are divided, it remains to be seen just how much of the feedback they intend to incorporate into their future work. CustomWritings' services appear to have improved over the years. Prices were adjusted and writers are screened based on their performance and expertise. However, it wasn't all cakes and bubbles for them, especially in early 2010 when they were bombarded with negative reviews. I admit I was upset after reading these but come 2018 and the company is striving to address these previous issues. For this, I give them a thumbs-up for trying to get back on their feet. Twin sites. The similarities of the websites is something I don't like about the company that owns them. The fact that the service can feel like a scam will make some people leave immediately, something I should have done. Quality. Too many bad cases regarding quality, I do not think there is a sense to take risks. They clearly want to paint a perfect picture as a reputable essay writing company. However, the issues they've had in the past put a huge smear on that image and they're still reeling from it despite current improvements. I wouldn't like to use CustomWritings.com again. They deliver any type of papers but in my case it wasn't worth the time and money. If you look at other companies I use, this one isn't the wisest choice. And what do you think about this site? Is CustomWritings reliable and legit? Write your Custom Writings reviews below. It's very interesting to me. Progressive Delivery: How Does it Work?